Benign prostatic hyperplasia (BPH) has historically been considered a fact of life for many men over the age of 50. The old adage states that men spend their youth making money and their golden years making water. As men age, their prostates grow in size and place pressure on the urethra, causing frequent and often painful urination. Its referred to as an enlarged prostate. Although BPH is annoying, it is not a life-threatening condition and does not lead to cancer. However, if left untreated, BPH can lead to more serious health conditions. Doctors now urge men experiencing BPH to become proactive about their condition early on in order to prevent the development of bladder stones, bladder or kidney damage, and urinary tract infections that can lead to sepsis. There is no known cure for BPH, but there are a number of effective treatments to manage the symptoms. Alpha-blockers can help by relaxing the muscle fibers in the bladder and prostate. Other drugs called 5-alpha-reductase-inhibitors can shrink the prostate over a year to 18 months. Unfortunately, once these drugs are stopped, the symptoms return. The good news is that there are natural supplements available to treat BPH early. 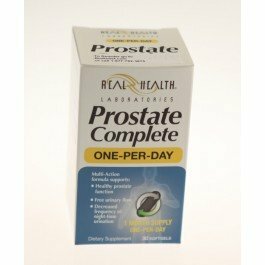 If you are looking for a natural and effective treatment for your BPH symptoms, then the answer is Real Health Prostate Complete. Prostate Complete is the result of years of research by urologists seeking to provide men with a natural solution to their BPH symptoms. If you are tired of frequent urination negatively affecting your social life and sleep habits, Prostate Complete can provide the natural relief that you are After. Visit us at Biorelief.com or Call Toll Free at 1-877-782-3675.